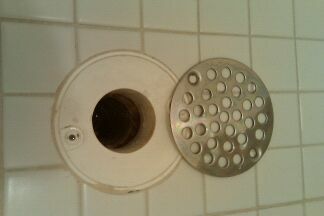 Shower drain our company unclogged for a customer. Periodically shower drains do get clogged up. Believe it or not but all sorts of debris gets past us. Most people have there shower drains cleaned once a year before they clog up. Never Put any store bought or home made chemicals down any drain or pipe. By waiting until your pipe clogs can result in a damaged pipe. Call Hiawatha Plumbing to unclog any drain in your home or commercial building.